Case International Harvester Parts. 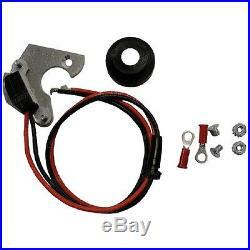 12v (-) ground for IH distributors reference #’s 353893R91, 353890R91, 357935R91, 353898R11, 353890R1, 356657R91, 353891R91, 362722R91, 3666069R91, 381687R91, 534444R91, 380622R91, 302473R91, 366928R91, 375423R91, 375423R91 and 380622R91. Electronic ignition for gas applications. Replaces 21A303D , EH4 Fits 100; 130; 140 COMBINE; 200 CRAWLER; 230; 240; 300; 330; 340 TRACTOR; 350; 400; 404; 424 TRACTOR; 444 INDUST/CONST; 454; 504 TRACTOR; 600 CRAWLER LOADER; 650 INDUST/CONST; A; AV; B; BN; C; C135 ENG; C146 ENG; C153 ENG; C157 ENG; C175 ENG; CUB; CUB 154 LO BOY; CUB 185 LO BOY; CUB LO BOY; H; HV; M; MV; SUPER A; SUPER C; Super H; SUPER HV; Super M; SUPER MD; SUPER MDV; SUPER MTA. Our ordering system is automated. MyTractor carries a full line of tractor parts, accessories , decals , emblems and I&T Shop Service Manuals for most makes and models of tractors. We stock parts for the following brands: Allis Chalmers, John Deere, CaseIH, Kubota, David Brown, Mahindra, Deutz-Fahr, Massey Ferguson, Farmall, Minneapolis-Moline, Fendt, New Holland, Fiat, Oliver, Ford, White, International Harvester , Yanmar, J. Case, Zetor and more! MyTractorParts is a major North American Distributor for Aftermarket Tractor Parts including Filters, Engine part, engine kits, front end parts, tie rods, cylinders, pins, seal kits, rims, wheel hubs, axle parts, bearings, transmission gears/shafts, operator station parts, seats, PTO, hydraulic / steering / water pumps, radiators, oil coolers, hay balers parts. Plough tools, rake teeth, alternators, starter and more!! The item “1700-5200 Case International Harvester Parts Electronic Ignition 100 130 140 C” is in sale since Wednesday, June 08, 2016. This item is in the category “Business & Industrial\Heavy Equipment Parts & Accs\Tractor Parts”. The seller is “mytractorparts” and is located in Canada, USA. This item can be shipped worldwide.